The charter debate: More schools, transparency and oversight? The billboard in Bridgeport promises students the chance to win a seat in a new charter school opening in August. “Enroll now! Accepting applications for grades 6-12,” reads the advertisement facing the highway. In Stamford, another charter school organization has already accepted 30 applications from parents who hope to win a seat in their school in August. But there’s a problem: the state has not committed to spend the $4.6 million needed to open these new schools next year. In fact, several top legislators support placing a two-year moratorium on opening new charter schools, given the sizable budget deficit facing the state or the “significant failures” recently identified with the organization that operates one of the state’s largest charter schools. 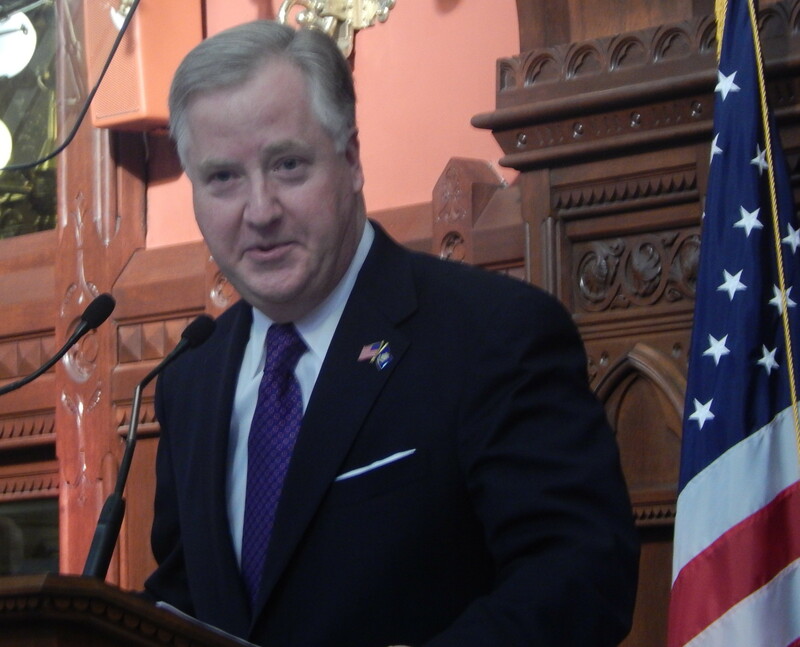 “I am supportive of the notion of pausing, in part because of the fiscal environment,” Connecticut House Speaker J. Brendan Sharkey, D-Hamden, said during an interview. Twenty-one state legislators have co-sponsored a bill placing a moratorium on new charter schools and requiring a review of the state’s 22 current charter schools, which enroll nearly 8,000 students. The legislature is also considering a series of changes to state law that would increase oversight, including requiring the nonprofits that run charter schools to be held to the same standard of public disclosure as traditional public schools under the state’s Freedom of Information Act. Who decides if new schools open? When members of the State Board of Education last spring approved six new charter schools — two more than the state had provided funding for – several legislators expressed concern that the board was making promises to parents it couldn’t keep. Parents hoping to get their children into a charter school traveled to Hartford last week. 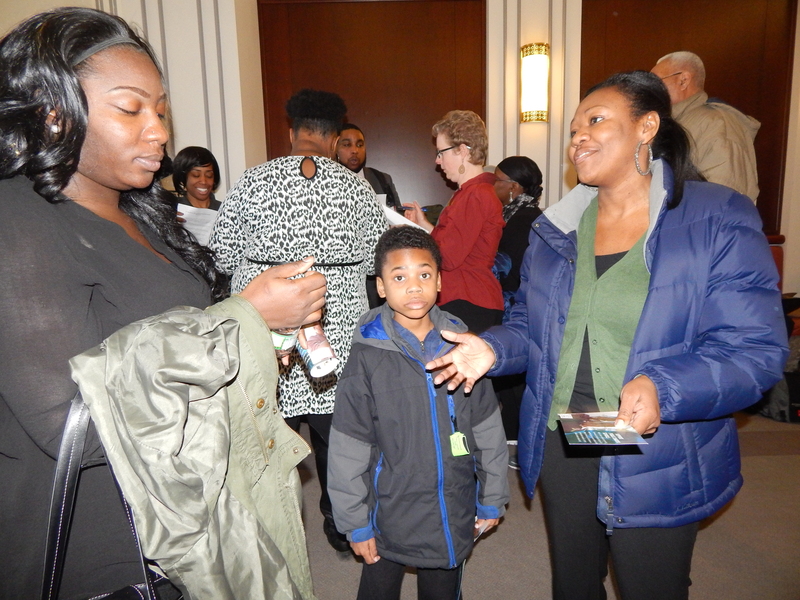 Pictured are parents from Stamford Nefretiria Gross (Left) and Dorothy St-Louis with her son. The co-chairs of the Education Committee agree. Rep. Andy Fleischmann, D-West Hartford, recently publicly scolded the acting education commissioner, Dianna R. Wentzell, for stating the schools are going to open as a matter of fact. To avoid confusion about whether a charter school will open, the Education Committee is considering legislation that would make clear that the state education board can approve only an “initial certificate” and that a review and formal funding approval from the legislature are required to open. An advertisement charter advocates are running on tv and radio stations statewide. 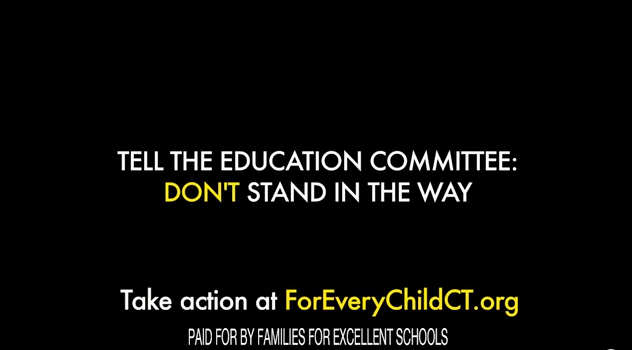 The Malloy administration opposes both the change in law and a charter-school moratorium. Wentzell told the Education Committee last week that the change would make the legislature responsible not only for creating policy but also for implementing it. Malloy acknowledged Friday that it is the legislature’s decision whether to fund new charters, but he said the state has a responsibility to do so and not place a moratorium on them. The governor’s proposed budget included the $4.6 million the two new schools need to open with some grades next year, as well as $7.8 million more to expand enrollment at existing charter schools, including the scandal-plagued Jumoke Academy in Hartford. Some legislators support further expanding charter enrollment. “I don’t want to close the door of choice for parents,” said Rep. Patricia Billie Miller, D-Stamford. Rep. Arthur J. O’Neill, R-Southbury, and Rep. Douglas McCrory, D-Hartford, also spoke in support during a lengthy public hearing on the topic last week. 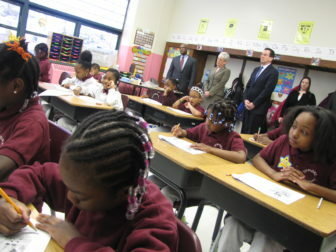 Students at Jumoke Academy in Hartford work on an assignment while Gov. Dannel P. Malloy, Lt. Gov. Nancy Wyman and Michael Sharpe watch from the back. It took the State Board of Education only seconds to unanimously approve, without discussion, a five-year renewal for Jumoke Academy’s charter in June 2012. In the months that followed, the state board and education department also signed off on putting the leader of Jumoke — who was also the leader of the charter management organization Family Urban Schools of Excellence (FUSE) — in charge of a Bridgeport and a Hartford public school as part of a state reform initiative called the Commissioner’s Network. The initiative is meant to increase state involvement in, and oversight of, low-performing schools. But in June 2014, the Hartford Courant began revealing a series of problems: The Jumoke leader, Michael Sharpe, had a years-old criminal record for embezzlement, and his charter management organization had hired family members and people with criminal backgrounds. These lapses have caused some legislators and local education leaders to lose confidence in the state education department’s ability to oversee charter schools. “There’s nobody in charge. These are Hartford kids. It’s frustrating,” said Robert Cotto Jr., a member of the Hartford school board and the director of Urban Educational Initiatives at Trinity College. Rep. Edwin Vargas said the education department hasn’t had the will to ensure accountability from charter schools. “If you have a tin ear [to problems raised], the only way we can address it is statutorily,” the Hartford Democrat told the Education Committee last week. 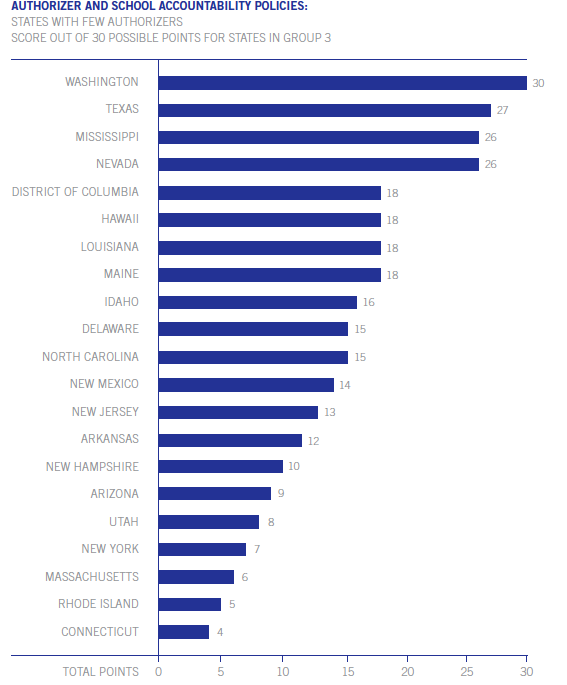 Connecticut is one of the worst states for policies that hold charter schools accountable, according to a recent report from the National Association of Charter School Authorizers, which advocates for strong oversight of these publicly funded schools. The education department changed its policies in the wake of the scandal to require charters to check criminal backgrounds and the Department of Children and Families’ child abuse registry. It also requires boards to have conflict of interest and nepotism policies. A spokeswoman for the department said the agency will ensure charter schools have complied before their charters are accepted and renewed. The renewal process also has been overhauled, said Kelly Donnelly a spokesman for the education department. “Our renewal used to contain a lot of open-ended questions. With this new rubric we are clearly expressing our expectations and what we expect to see as proof,” she said. With six charter schools up for renewal at the state board’s meeting in two weeks, the applications, the education department’s recommendations and the schedules for public comment (which have since passed) are not posted on the department’s website. A spokeswoman said the department gives notice of the public hearings in legal advertisements in local newspapers and sends letters to the superintendents of districts surrounding the charter school. The bill the education committee drafted also would require the nonprofits that run many of the state’s charter schools to be held to the same standard of public disclosure under the state’s Freedom of Information Act as traditional public schools. When it comes to the records of traditional public schools, state law requires “every person shall have the right to inspect such records promptly.” Certain records are exempt, such as those relating to individual students, medical records, test questions and security. However, state law treats charter management organizations as nonprofits. The Connecticut Supreme Court has ruled nonprofits are subject to the FOI act if they are the “functional equivalent” of a public agency, taking into account such factors as whether they perform a government function, whether they receive a certain threshold of public money, and whether the organization was created by the government. Because charter management organizations are not automatically presumed in law to be public agencies, it can take months to get information. The Hartford Courant has an eight-month-old case pending before the Freedom of Information Commission relating to FUSE, the charter management organization linked to Jumoke that has denied the paper’s information requests. “We are not a public agency,” Heidi L. Hamilton, the interim co-chief executive officer of FUSE, responded to the Courant’s request for the employment contracts of school staff, salary information and rental contracts. A hearing on that complaint is set for April 15. Likewise, leaders of Capital Preparatory Schools Inc. and Achievement First Charter Schools Inc. denied requests for information made by the state’s largest teachers’ union last summer. 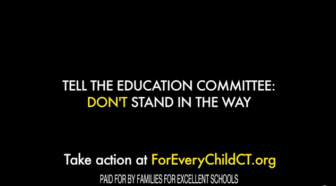 “Disclosure rules for not-for-profit corporations like Achievement First are not governed by [the FOIA] of the Connecticut General Statutes,” Tony Siddall, a senior director with Achievement First, responded to the Connecticut Education Association’s request. The union had sought the names and contracts of employees and contracts with outside groups. The Freedom of Information Commission is scheduled to hear the CEA’s complaints Tuesday. Achievement First operates the largest network of charter schools in the state. Capital Preparatory Schools plans to operate the new charter school in Bridgeport. The FOIC determined in 2008 that Achievement First is a public agency. Last week, Achievement First President Dacia Toll pleaded with the Education Committee not to change the law. Toll also said it would be “discriminatory” to specifically treat charter management organizations as public agencies among all the different types of nonprofits. “We want to focus on the work of helping schools change the life outcomes of kids, not processing a litany of FOIA requests from charter school detractors and naysayers,” she testified. Toll’s Achievement First charter management organization spent $31.8 million in 2012 running charters in New York and Connecticut, according to the organization’s most recent tax filing. Preston Green III, a professor of educational leadership and law at the University of Connecticut’s Neag School of Education, said charters should be held to the same standard as traditional public schools. Rocked by scandals, Green said Detroit and Pennsylvania have now made their charter schools subject to more public disclosure. “It’s all over the map now. It’s not clear to me how it will all shake out,” said Green, who has written extensively about best practices for charter schools. Fleischmann, the leader of the state’s education committee, said after hearing testimony on the bill he does not think anything needs to change. “Existing state law works well,” he said during an interview. The state education department also supports the current law. A spokeswoman for the department said it recently began requiring that contracts between charter boards and charter management groups include existing law that details when the CMOs are subject to public disclosure. Charter school leaders will tell you charter schools outperform more than 80 percent of their neighborhood schools. But critics respond that the charter schools are not serving the same type of students because they force students with discipline problems back to their neighborhood schools and cherry-pick their students. “We do not cherry-pick high-achieving students, we produce them,” Bruce Ravage, the founder of Park City Prep Charter School, said during a rally last week at the state Capitol complex. Melodie Peters, the leader of the state chapter of the American Federation of Teachers, doesn’t believe their figures. However, research done by the education department on whether children are better off in charter schools is not yet complete, a spokesman said. The need for quality research is an issue education department officials are well aware of. They announced in December that they have been working for some time to complete research that will evaluate performance in Connecticut school-choice programs for the first time. It’s unclear when that report will be made public. Several legislators want such an assessment and a plan before any new schools open. They also want to see how the growth of charter schools are affecting traditional neighborhood public schools. “Let’s pause and evaluate the experience we have had,” said House Speaker Sharkey. Meanwhile, charter schools continue to accept applications.